Bringing together data, systems, and people for a digitally connected business. Domo transforms the way these companies manage business. The power of the platform. Seven enterprise-scale systems working together to connect your business and drive smart decision-making. Rapid deployment through app solutions. Start up in days, not months. Built for thousands of users. Scales up to billions of rows of data. Seamless integration to any data source. Governed and certified content delivery. Best in class multi-layer security. Empower everyone to do more with data. With Domo, your systems are linked and connected to your people, allowing them to access the right data, at the right time, on any device. Get data insights in real time for fast decision-making. Use built-in collaboration and productivity tools to foster discussions about data insights. With Domo, our data is transparent and accessible. Instead of waiting for month-end reports, we look at current and relevant data every day to make real-time decisions. Works with the data and systems you already use. Make the most of your existing investments with the platform’s flexible architecture. 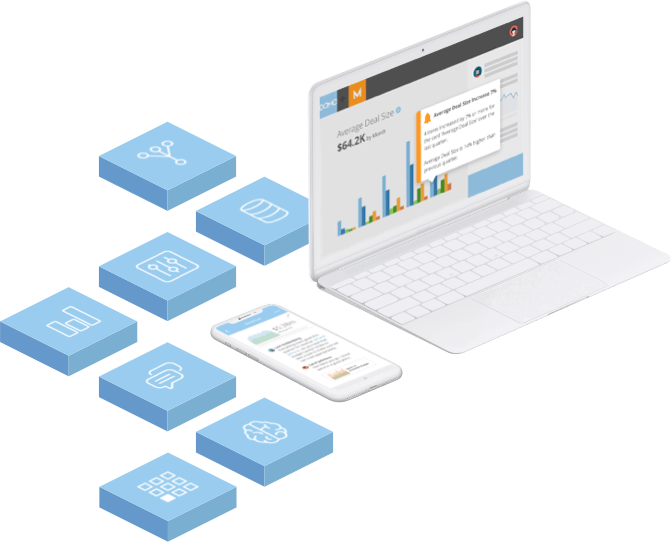 Use Domo with your data lakes, data warehouses, ETL tools, and more. Connect any systems with Domo as the hub between them for bi-directional data exchange. Domo has far exceeded my expectations. It was much simpler to get disparate data sources into the system than I'd ever imagined. Endless possibilities for building solutions on the Domo platform. From custom apps and connectors to full app suites built by Domo, the extensibility of Domo’s platform is second to none. Domo Apps get you real-time retail metrics you need, the moment you need them. Your programmatic advertising data, all in one place, for on-demand insights. Fortune 50 companies use Domo to see metrics they need for predictive insights. Real-time marketing reporting across channels for improved campaign performance. What people are saying about Domo.